prevent the child fire setter from becoming the adult fire setter. Fire deaths, numerous injuries and property damage into the millions of dollars have been directly attributed to children lighting fires in Manitoba on an annual basis. Juvenile arson arrests exceeded adult arson arrests for the first time in history. The number of fires set by children is growing. In the time it takes to read this, a child may have changed his/her life and the life of his/her family with the strike of a match. The Youth Firestop Program relies on referrals from concerned parents or guardians, human resource agencies, police, local fire departments, school boards, etc. First, the child and parent or guardian is interviewed to assess the level of concern with regard to the firesetting behaviour. Next, the child may be called back to a local fire hall or school for a series of "educational visits" or may be referred to a community human resource agency. Any child can be a potential fire setter. They may be motivated by a curiosity for fire. A crisis in a child's life may lead to fire setting as a way of expressing feelings of helplessness. Fire setting is a symptom of another problem. Contact your local fire department and ask about the Youth Fire Stop Program or you may contact the Manitoba Youth Fire Stop Program at 1-888-253-1488. The Manitoba Youth Firestop program is dedicated to preventing child-set fires. A program representative will work with you and your child to help ensure the fire setting stops! 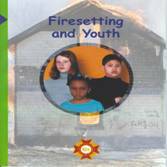 Fire Setting and Youth is designed specifically as a resource for parents, educators and professionals to discuss fire setting with children and youth. 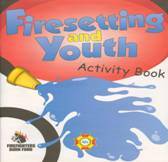 Fire Setting and Youth talks about the attraction and implication of fire, in child friendly language with colored photographs illustrating concepts on each page. Price of the book and activity booklet is $15.00 plus GST and shipping.